ÆSTHESIA films and music opened the reception and registration period of Generation W, a non-profit community and annual conference that embraces the guiding tenets of education, inspiration, and connection and the power of women’s leadership. On the main stage 40ft screens played the ÆSTHESIA films on repeat while the rest of the theater was cast in color filter lights mimicking the colors in the films. The music of ÆSTHESIA by ALURIA, echoed out into the lobby and created a relaxed and calming environment as everyone prepared for a day of intense workshops and challenging panel discussions. ÆSTHESIA was a multi-sensory experience inspired by six flowers that have been historically used for their therapeutic properties. 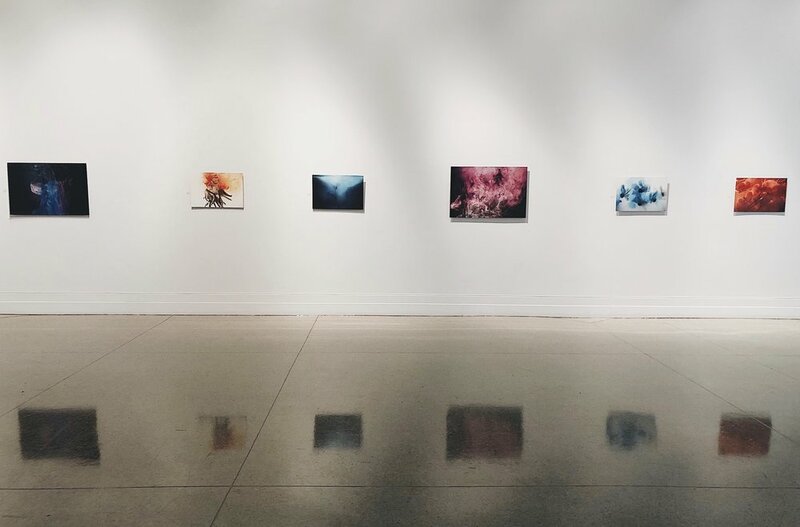 The exhibition provided stimuli for sight, sound, smell, taste, and touch with the intent to see if experiencing flowers through each of the senses could result in positive physiological responses. Visitors were first greeted by a tree-like structure at the front of the exhibition and large photos of each flower. A soundtrack, created by ALURIA in collaboration with Garner’s videos included measured wavelengths taken from the actual live-recording of each chosen flower. Not Impossible Labs provided haptic suits allowing visitors to feel the vibration of the audio while watching each film. Methods and Madness made edible rock candy with each flower as an ingredient and Christopher Brosius of I Hate Perfume, just after exhibiting at the Smithsonian Cooper Hewitt Design Museum, also joined Garner to provide unique scents made distinctly for each flower explored in ÆSTHESIA. Ethereal Bodies is a glimpse into three bodies of work that Garner has created in collaboration with a variety of artists from 2015 - 2018 in Brooklyn, NY. All three bodies of work (Study Sessions, SYNÆSTHESIA, and ÆSTHESIA) share a common theme of wellness and an exploration of the mystery in the natural world. 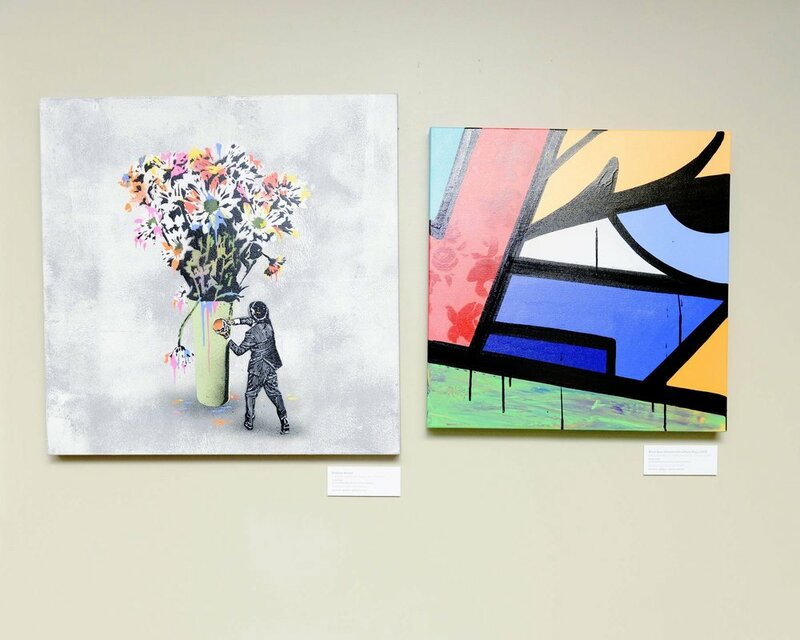 Combined into one exhibition they create a narrative that examines nature and our experience with it through a vibrant hue of colors, organic elements such as water and fire, and still lives that turn mundane objects into fantastical personas. For six weeks the full film and audio for ÆSTHESIA was installed in the lobby and patient rooms in the main Boston office of rehabilitation clinic, Column Health, who incorporates art therapy into their practice for long term stigma prevention. The results were exceedingly positive and encouraging from the patients and therapists for further exploration of the bridging of art and wellness coming together to make a lasting impact on the healing and recovery process for patients dealing with a variety of symptoms. In collaboration with Wallplay, Garner created six multi-sensory meditation stations that explored the sound vibrations of the original six-tone musical scale, Solfeggio Frequncies. Each station included a looping video by Garner and audio track for each frequency made by electronic musician ALURIA. Next to each video station was a photograph from the video and pedestal with live flowers from the video and an essential oil blend designed based off of the videos. Visitors could learn more about the intent of each stations audio and visuals from educational text vinyl on each pedestal or immerse themselves in the work by sitting on meditation cushions in front of each video screen. featuring Nick Cave, Ron English, Logan Hicks, Icy & Soot, COPE, c215, Logan Hicks, Beau Stanton, Crash, Joanne Leah, Annika Connor, and more. On a broken down boat in the middle of summer in a canal in Bushwick, Brooklyn, Garner collaborated with art collective OSMUNDA and Future Clear to create a meditating oasis for the community to escape the shackles ofcity life and spend an evening relaxing to ambient sound vibrations, dancing, food, performance art, and a SYNÆSTHESIA lounge where videos played on loop all evening. A weekend long event hosted in the lounge of Ludlow House, NY, designers, painters, and performance artists co-collaborated to create a an immersive retail and art experience to launch off the Spring season. 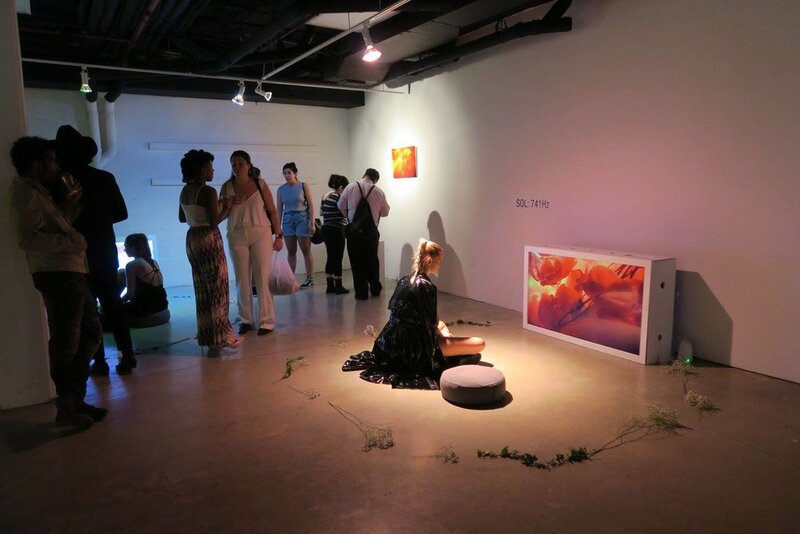 The lounge area hosted an ongoing loop of SYNÆSTHESIA with a live performance by ALURIA on opening night.